I have been consistently disappointed with Mexican food since moving to New York. While there are plenty of Mexican restaurants in every neighborhood, the majority are as basic and uninteresting as your typical Chinese take out. Some even serve Chinese food. I know there are a lot of gems out there; I just haven’t found them as of yet. Until now. I first heard about La Superior after a spot in the New York Times raving about it. So, on one of my regular food explorations of New York City I couldn’t resist. (Plus I live five minutes from the place.) It’s on the much less hipster south side of Williamsburg. NY Magazine says it â€œevokes a roadside diner in Guadalajara, perhaps, or East L.A, which I think is fitting. There are just ten tables or so and a small bar all in a single dining room painted red with the odd piece of Mexican paraphernalia. A small porch was being added outside on last visit. 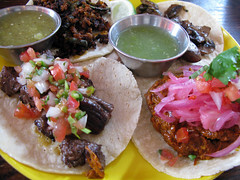 The menu is comprised of Mexico City street fare, but before going on about anything else on the menu, I have to start with the tacos, which are as far as I have found the best in all of Brooklyn. In fact they do consider La Superior a taqueria. At $2.50 a pop (except for the beef tongue at $3.50), they are nothing less than authentic and carefully prepared using fresh, high quality ingredients. All of the tortillas are small, the smallest size as you would see from a pushcart in the DF, but they are piled high with fillings. The Carne Asada taco is in chunks with fresh parsley. The Cochinita Pibil, the slow cooked pork, is pulled and tasty and topped with purple pickled onions. The Pescado Zarandeado, their only fish taco, is a delight with tender pieces of white fish, which isnâ€™t fried, and it is topped with Pico de Gallo sauce (made fresh). The rest of the menu is equally as satisfying. I have become enamored by Queso Fundido on my frequent trips to Honduras while researching Frommer’s Honduras (1st edition out in October, 2009), though there they call it anafres and it is ever so slightly different. La Superior serves it in a tin bowl with warm corn tortillas. A little greasy but still worth ordering. Ezquites are toasted corn kernels with epazote leaves, lime, fresh cheese, and mayo. They are a favorite street snack in central Mexico and do justice at La Superior while waiting for the rest of your meal. The Sopa Tarasca, a staple of the Michoacan highlands, combines creamed black beans with four sides of ingredients to mix in: tortilla crisp, cream, crumbled white cheese, and ancho peppers. Itâ€™s a meal in itself. They do have a few entrees too: a Torta Ahogada (a famous Guadalajara sandwich), enchiladas, and Alambre de Res (grilled skirt steak), but I’m in a habit of ordering so many small plates that I never get to them. They don’t serve alcohol, at least until they can manage to get a license, but they do have aqua fresca (prickly pear, lime w/zest, etc) and Mexican sodas.